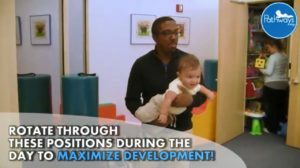 New parents experience a lot of firsts with their baby! It can be overwhelming at times… Not to worry; Pathways.org is here to help! We try to make all this information a little easier to find and understand. And more helpful parenting tips! All these areas of development are important for building skills your child will use throughout their whole life. Teething isn’t fun for baby. You may notice an increase in fussing or crying, drooling, biting, and a loss of appetite around 3-12 months old, but there are ways to comfort them. Did you know mirrors can help your baby learn? That’s right! The mirror in your bathroom right now can help your baby. In fact, mirrors are really fun toys for babies. Learn how they can help your child develop. 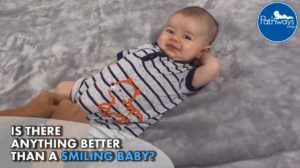 Have you tried putting baby in side lying? The side lying position allows them to explore, move, and learn about their body. Plus, it’s great to help baby learn to roll over. Parents know to do Tummy Time with baby but do you know why it’s important? Learn why Tummy Time matters and tips for what to do if baby hates Tummy Time. 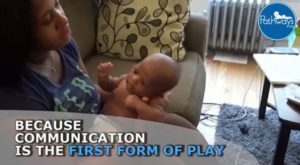 Baby’s communication development starts long before they say their first word. Learn how and what parents can do to help develop communication skills. 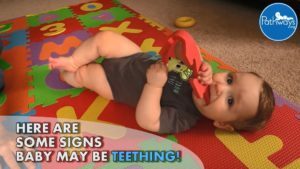 Baby sign language has become a common way to communicate and reduce frustration because it allows your little one express their wants and emotions. Try using these signs! Do you ever wonder what your baby is seeing? Find out what they can see by age as their vision develops. Understand baby’s smile: when to expect it, how to encourage it, and what comes next! Kids are asked, “What do you want to be when you grow up?” all the time. You can help your little one be what they want by developing their life skills! Check out these signs to tell if baby is ready for solid foods, plus tips for making starting solids easier. 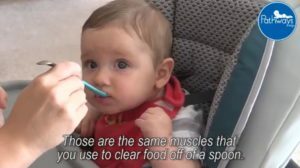 Did you know eating can help baby learn to talk? They both use the same muscles! 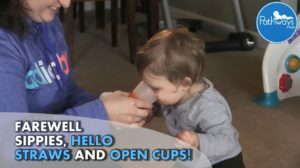 Saying goodbye to sippy cups can take some patience, but it’s worth it in the long run! Try no-spill cups with straws first, and then transition to open cups. Is baby’s face messy? Baby having a face covered in food can be a good thing. Every parent uses containers, such as carriers, car seats, bouncer seats, and strollers, on a daily basis, but did you know you can overuse them? Learn tips to reduce baby’s time in carriers. The development of both fine and gross motor skills allow a child to explore the world. 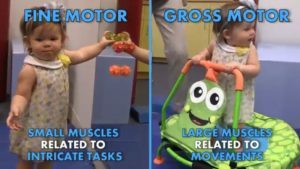 Different activities can help develop fine and gross motor muscles. 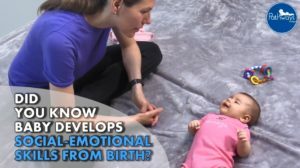 Baby needs to experience different positions during the day to be able to play and explore. Try putting baby in these positions during the day. Most people know 5 senses but there are 7! Proprioception (body awareness) and vestibular (balance and movement) are important for sensory development. Baby uses touch to explore the world around them. Not only can you help baby develop their sense of touch, but you can also bond with baby. 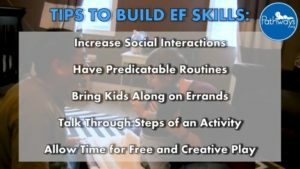 Did you know the social-emotional skills your child will use in school and with friends can start being developed from the time they’re born. At one month old, talking to baby is how you can play with them. Give baby your undivided attention and talk to them everyday. Play can start as soon as baby is born! Smiling, making faces, and using different voices when talking to a newborn are all ways to play with baby. 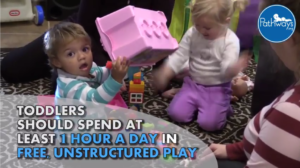 What is the difference between structured and unstructured play? Find out and learn why it’s important for your child to have both. Young children develop their social skills through the six stages of play, all of which are important for their development. All of the stages of play involve exploring, being creative, and having fun.